Film memorabilia consist of anything related to cinema that one considers valuable, whether sentimentally or financially. Items may include original autographs, original theatre posters used to advertise the film, film props, photo stills, original costumes, original film scripts and presskits, and more. The concept of film memorabilia began with such things as scrap-books, autographs, photographs, and industry magazines, but quickly expanded in the post-World War II era. Collectors began seeking out original advertising material, and the classic “onesheet” movie poster became a popular object to own for any given film. Other material, such as lobby cards, international posters, personality posters, and glass slides also became sought after. Today, the field of film memorabilia collecting has grown into an internationally recognised community of increasingly serious collectors, and also commonly includes props, costumes, and production materials such as concept art, call sheets, and screenplays. Auctions of memorabilia from such franchises as Star Trek and the James Bond films often net millions of dollars in revenue from auction houses such as Christies and Sotheby’s. 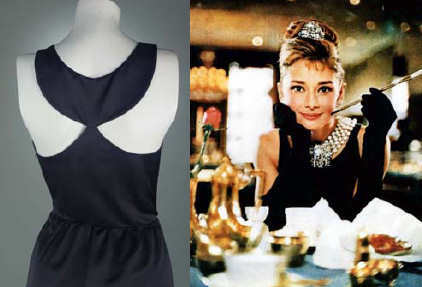 Audrey Hepburn’s iconic black dress designed by Hubert de Givenchy from the much-loved 1961 classic film, Breakfast at Tiffany’s, sold for £467,200/$923,187/€692,390 at Christie’s South Kensington in the Film and Entertainment Sale on 5 December 2006. The price establishes a new world auction record for a dress made for a film. 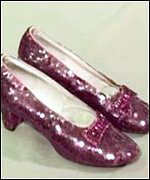 Original memorabilia from the Wizard of Oz has seen record prices notably the famous Ruby Slippers which fetched $660,000 when at auction at Chritie’s East in New York in May 2000. 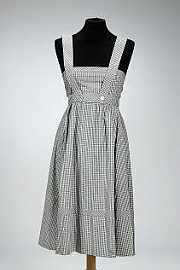 The original dress worn by the star Judy Garland when she immortalised the character of Dorothy in the classic film masterpiece, The Wizard of Oz, sold for a staggering £140,000 at Bonhams in April 2005. In January 2006 RM Auctions (Arizona) in their Vintage Motor Auction sold “The Most Famous Car in the World.” for a record $2,090,000 in January 2006. 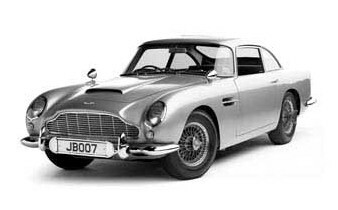 The stunning Aston Martin DB5 which roared into the popular consciousness with the release of the James Bond epic Goldfinger in 1964. No other car has so completely captured the imagination of generations of filmgoers. The Silver Birch DB5, and the purposefulness with which it was deployed, represented the perfect embodiment of the virtues of the character first launched in the Ian Fleming novels in 1953: stunning elegance, international intrigue, and the command of visceral power. Luckily smaller versions have been produced over the years by makers such as Corgi, the Danbury Mint and others. 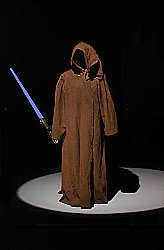 The original Obi-Wan ‘Ben’ Kenobi’s cloak worn by Sir Alec Guinness in the masterpiece science fiction adventure, Star Wars (1977) sold for £54,000 in Bonhams Costume Sale in March 2007.